NAVAL AIR STATION WHIDBEY ISLAND, Wash. – There has been a change to the remaining carrier-based flight training operations scheduled to occur at Naval Air Station Whidbey Island Ault Field and the Outlying Landing Field (OLF) in Coupeville, Wash., the week of April 1-7, 2019. Feel like some light reading? The 117-page CAG Report on Possible Integration of EMS and Fire can be downloaded from the San Juan County #1 Public Hospital District's website. Deputies in San Juan Islands responded to 181 calls between March 13-19, 2019 including: Orcas Island Deputies responded to a suicide attempt call in the Eastsound area. The reporting party advised that they wanted to commit suicide and that they were going to make the cops shoot them. The subject was taken into protective custody without incident. According to an audio recording of the Citizen Advisory Group's last meeting, the recommendation they have given to the San Juan Island Fire District Commission and the San Juan Public Hospital County #1 Commission is to integrate San Juan Island EMS into the Fire Dept. EMS, which has its own levy, is currently overseen by the Hospital District. At the meeting, Nathan Butler demonstrated how the report could be summarized, "We basically say, we are recommending a consolidation. Probably the simplest way to do it is annex the Town [into the fire district] and lid lift the Fire District levy. We recommend you expand your board to accommodate people from Town and [unintelligible]. We are recommending a memo of understanding for the outer islands." It's the end of separate week day and weekend ferry schedules as Washington State Ferries Spring schedule goes into effect Sunday, March 31, 2019. International service resumes with one sailing to Sidney, B.C. Town seeking applicants for open positions on Friday Harbor Arts Commission. The Town is accepting applications for two open positions on the Friday Harbor Arts Commission (FHAC). Commissioners are unpaid volunteers who represent the interests of the Town, community, and local artists in advising the Town Council on the cultivation, selection, acquisition, and placement of public art. The PHD Commission and the Fire District Commission will hold a special meeting at 5 p.m. Tuesday, April 2 at the Fire District offices located at 1011 Mullis Street in Friday Harbor. A representative from the Town of Friday Harbor is sending a representative. 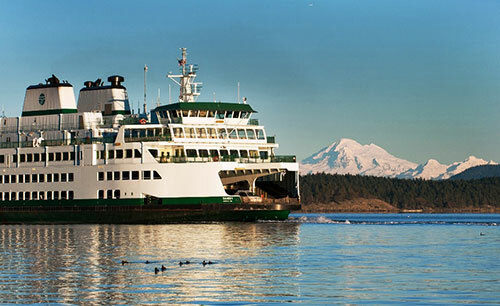 Beginning Friday, March 29, there will be reduced vehicle capacity on Washington State Ferries Anacortes/San Juan Islands route when the 90-car Sealth begins service as vessel #2, replacing the 144-car Yakima.